People with disabilities are members of the community just like anyone else. They shop, volunteer, vote, attend religious services, and send their children to local schools. Welcoming people with disabilities means being more welcoming to everyone. Treating all the people who come to your businesses or community organizations with courtesy and individual respect is the cornerstone of hospitality. 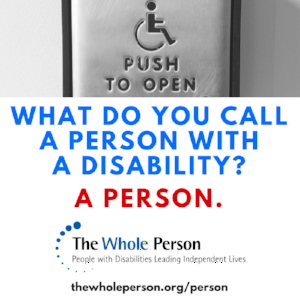 To arrange a presentation or learn more about The Whole Person, contact Lea Klepees, Development and Community Relations Specialist; 816-659-9403, lklepees@thewholeperson.org. Presentations limited to the Kansas City Metro Area only. Donations/honorariums are appreciated for any offsite speaking engagement or business training event. We currently offer speakers to groups, organizations or businesses at this time.